Chef Suzanne Goin and her business partner, Sommelier Caroline Styne announce Sunday, August 12, 2012 for their summer Rib Fest at Lucques, featuring a feast of slow-cooked ribs, hot wings, and sides that has become a Lucques tradition since 2000. A week of preparation goes into the smoking of pork, beef and lamb ribs, spreading the lure of wood smoke throughout the neighborhood and attracting a growing swell of Rib Fest Groupies for the annual BBQ celebration. The family style menu, priced at $55 per guest features generous portions of Saint Louis Style Pork Ribs; Braised Beef Back Ribs; Spicy Lamb Spare Ribs and “Too-Hot-To-Handle” Chicken Wings. Sides of Cole Slaw, Baked Beans, Long-Cooked Greens and Grilled Cornbread are included along with a mouth watering Peach Cobbler with Strawberries and Buttermilk Ice Cream. Lucques suits up for the rib rodeo; its wranglers and cowgirls – staff and guests alike – dress in denim, bandanas, boots and Stetsons. The dining room and patio are bursting with bouquets of sunflowers and filled with the special playlist sounds of Hank Williams, Willie Nelson, Johnny Cash and Gram Parsons. Eating with hands is encouraged, with a plentiful supply of butcher papered tables and ‘wet-naps’ for all. The bar offers a special selection of Cowboy Cocktails, including the Longhorn Lemonade and a “Beer in a Can,” fitting the occasion. Rib Fest at Lucques begins at 12:00 noon and serves continuously until 9:30 p.m. Reservations are a must for this sell-out dinner and can be made by calling the restaurant at 323. 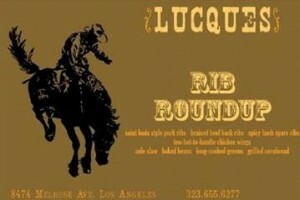 655.6277 or online at www.lucques.com. Lucques is the flagship restaurant opened by Goin and Styne in 1998. Originally the rustic carriage house of the Harold Lloyd Estate, Lucques’ decor of brick, wood beams, garden setting and wood-burning fireplace provides a warm and intimate setting, a favorite among couples or groups of families and friends. Suzanne Goin was named one of Food and Wine magazine’s “Best New Chefs” in 1999, within a year after opening her first restaurant. In 2005, Suzanne’s cookbook, Sunday Suppers at Lucques, was published by Alfred A. Knopf. In 2006, the James Beard Foundation acknowledged Suzanne’s culinary achievements with the award for Best Chef California and an award for her cookbook, Best Cookbook from a Professional Viewpoint. Goin and Styne are among the most respected restaurateurs in California, and continue to receive praise for their food, beverage programs and service from the Los Angeles Times, New York Times, Wall Street Journal, L.A. Weekly, Daily News, Condénast Traveler, Gourmet, Bon Appétit, Saveur, Los Angeles, Angeleno, Zagat and Gayot.com. They are co-founders of L.A. Loves Alex’s Lemonade, scheduled for September 29, 2012, their fundraiser benefiting research for childhood cancer which has raised over $600K since its inaugural year in 2010.